Four women were busted Thursday for grab-and-run robberies at two Victoria's Secret stores in Contra Costa County — and using a stolen vehicle in an effort to get away, police say. Walnut Creek police officers said they were called to a robbery at a Broadway Plaza location of the lingerie company. A patrol officer had tracked down the suspects in an SUV – which police discovered was stolen as well – and took them into custody. “We love to have visitors shop and dine in our lovely town. We just appreciate it when people actually PAY for the items they want,” Walnut Creek police wrote on Facebook. 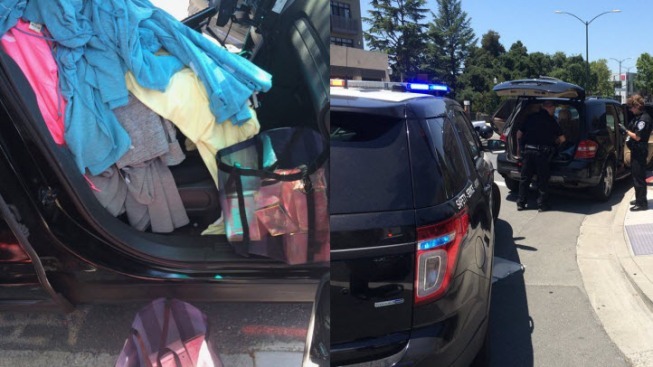 Pictures of the arrest, posted to social media, show clothes as well as Victoria's Secret bags and unopened boxes in the car. That’s not all: Walnut Creek police linked the same suspects to an earlier robbery at a Victoria's Secret in Concord. “Criminals be warned, we don't tolerate criminal behavior and if we catch you (which we will), you will go to jail,” they wrote on Facebook, signing off with #keepingwalnutcreeksafe and #crimedoesntpay.